B﻿harwa Aloo (Stuffed Potatoes) is a unique and amazing North Indian dish. This dish is made with round scoped fried potato shells stuffed with paneer, nuts and spices and then cooked in spicy gravy. 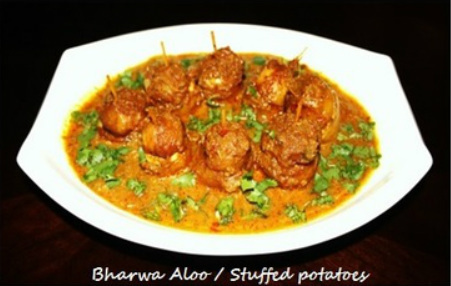 Bharwa aloo dish has an amazing taste and very tempting looks. 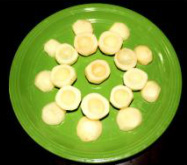 Potatoes are every ones favorite and they are prepared in many different ways and combination. They could be cooked as a main course or a side dish you will always find potato dishes on the dining table. Every region in India have different recipe of stuffed potatoes but stuffing can vary, using different cheeses, nuts and vegetables. So make the variation and try to cook stuffed potatoes for your guest and parties. ​ minutes or until they become translucent. 2. 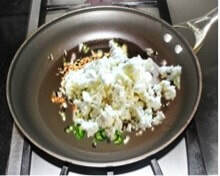 Add chopped green chilies and chopped almonds and sauté for few seconds. 1. Wash and peel the potatoes and Keep them in the water to avoid discoloration. ​2. Take one potato at a time and gently slice off the top. Save the top for the cap. 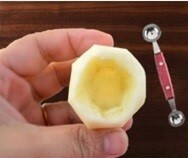 or knife to scoop out the center of potatoes) Keep the potatoes in the water. ​ and dry them with towel. 5. Once oil become hot gently slip in the potato shells and fry them on medium heat for 10 to 12 minutes or until they become golden brown and crisp from outside, while frequently flipping them around every 2 to 3 minutes. 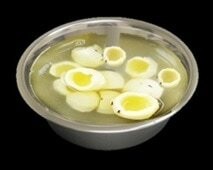 Remove them from the oil and place them upside down in a plate over paper towel so that extra oil is absorbed. 6. Now gently slip in the caps of potatoes in hot oil and fry while flipping them around every 2 minutes. Once the caps become golden brown take them out from hot oil and place them in the plate over paper towel. 1.Soak the Almonds, Cashews and Poppy seeds in the hot water for 20 to 30 minutes. Once almonds are soaked take their skin out. ​ and grind them to make a paste. Transfer the paste into a bowl. Keep it aside. 4. On high heat add the oil in a frying pan; add minced onions and garlic and sauté, while periodically stirring. Onions will have a lot of water so for the first 8 to 10 minutes keep the heat high so that all the onion water evaporates quickly. 5. While onion mixture cooks add the Tomatoes to the same blender and puree. 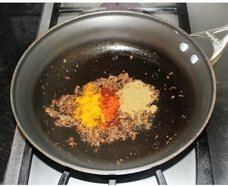 ​ and Turmeric powder and mix with the onions and fry for few seconds. 8. Add Tomato puree and yogurt nut paste. 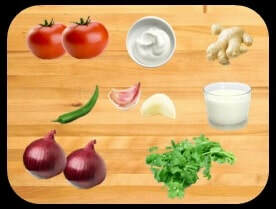 With the tomato puree and yogurt, onion masala become watery turn the heat high for 2 to 3 minutes, so that water evaporates quickly. Frequently keep stirring the onion masala, turn the heat down to medium. 9. 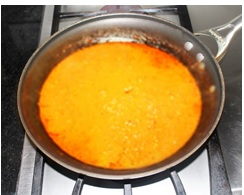 In about 5 to 6 minutes tomato puree and onion masala will blend together. pan and cook for 10 minutes. 13. Once you have the desired consistency of gravy add stuffed potatoes. ​15. While cooking periodically with the spoon take some gravy and pour over the potatoes to cover them, because the potatoes are tender and stuffed and you do not want to turn them around often they may break. If you want to stir the gravy just shake the pan gently. Add more water if needed.Turn the stove off. serving dish then transfer the gravy and garnish it with coriander leaves. 2. Nuts makes the gravy thicker.